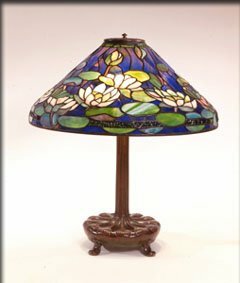 This is a very colorful "Pond Lily" pattern table lamp with a cone shaped 20 inch shade. It is fairly rare to find and is model #1490. The base is a "Library" standard, "cushion" style, large, model #367. Both the shade and base are signed.